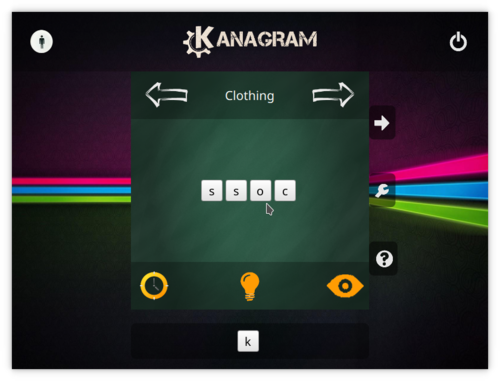 Kanagram is letter order game based on anagrams. 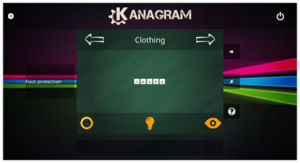 Kanagram mixes up the letters of a word (creating an anagram), and you have to guess what the mixed up word is. 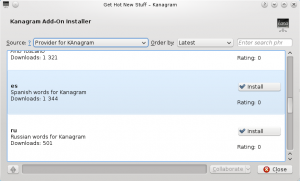 Kanagram features several built-in word lists, hints, and a cheat feature which reveals the original word. It also has a vocabulary editor, so you can make your own vocabularies, and distribute them through Kanagram's KNewStuff download service. Kanagram has a neat user interface which is reasonable even for younger children. 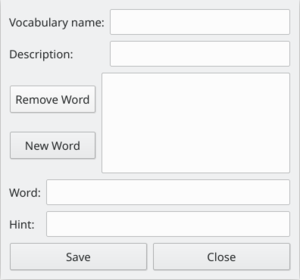 Word list editor of Kanagram. Downloading new stuff for Kanagram. This page was last modified on 15 October 2014, at 16:34. Content is available under Creative Commons License SA 4.0 unless otherwise noted.